Charities play a vital role in society, assisting some of the most vulnerable people in our communities. However, the recent economic climate has led to a reduction in public funds and a drop in voluntary contributions. 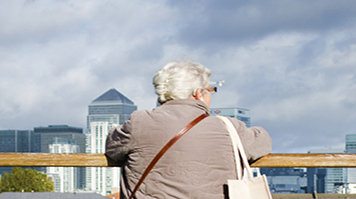 As a regional charity working with London borough Age UKs and its national organisation Age UK, Age UK London (AUKL) recognised that to continue accessing funding streams and raising the voice of older people across the capital, there was a need to rethink their research capabilities. The Knowledge Transfer Partnership (KTP) developed a solution for AUKL to review its existing research model, launch a new staff research toolkit, as well as create a data management system, accessible for staff. KTPs are government-funded programmes designed to help businesses improve their competitiveness and productivity through the knowledge, technology and skills available within UK universities. The KTP saw LSBU's Academic Support Team, consisting of Professor Keith Popple and Project Associate Ben Donovan, briefed to evaluate and review AUKL's existing research model - to enable the charity to embed a best practice research model, produce core research which tested the model during the life of the KTP, as well as report outcomes to their stakeholders with creativity and impact. AUKL wanted to review and upgrade its existing research model, introduce a staff research toolkit, as well as create a one-stop knowledge store for easy access of data and information. Ben Donovan, reviewed AUKL's existing practices, mapping their research model and identifying the potential for improvement: "It was clear that an online knowledge store was needed to allow existing data and information to be brought together in one location", Ben said. Working with LSBU through this KTP has enabled AUKL to apply good research practice throughout the organisation. This has enabled improved representation of older Londoners which is the foundation for the campaigning and policy-influencing activities undertaken. In return, the learning from this KTP and the imbedded nature of the research role within AUKL has also informed the co-authoring of academic papers with LSBU and subsequent dissemination of findings at events. The work needed to find suitably skilled staff, so project timescales were amended to source their expertise so this work could be carried out simultaneously with other aspects of the KTP. The KTP enabled the charity to embed a best practice research model, produce core research which tested the model during the life of the KTP, and report outcomes to stakeholders with creativity and impact. "This was a very successful partnership that benefitted all parties and demonstrated the value of KTPs between universities and the charity sector," says Keith Popple, LSBU. The jointly-authored research papers, 'Your Priorities', 'Dignity in the Capital' and ' A Wealth of Wisdom' have been shared with over 1,500 stakeholders, enhancing the charity's reputation as a knowledge-base in age-related matters. This was a very successful partnership that benefitted all parties and demonstrated the value of KTPs between universities and the charity sector. Through the KTP, AUKL has developed a solid bank of evidence, giving them a power base to influence Government policy in service improvement for older people. It has also enabled AUKL to successfully access revenue through bid applications, research practice workshops and consultancy to other VCS organisations.